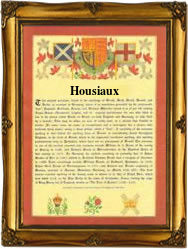 Recorded as House, Howse, Hoose, Housaman, and Houseman (English and Scottish) and as Housse, Dehouse, Houssier, Houssay, Housseman, Houzelle, Housiaux, and Houssiaux, this unusual and interesting name is residential or perhaps occupational. It described a person who was employed at, or who had some connection with, the largest and most important building in the settlement, or who lived by such a place. This may have been the great house of a nobleman or the landowner, or a religious house, a monastery or convent. Job-descriptive surnames originally denoted the actual occupation of the namebearer, and only later became hereditary when a son followed a father into the same occupation. In some cases the name may have referred to a "householder", someone who owned his own dwelling as opposed to being a tenant. In the Middle Ages most of the population lived in huts or cottages rather than houses. The derivation is from the Olde English pre 7th century word "hus", meaning house. Early examples of recordings include John Houseman of Colchester in Essex in the year 1365, whilst later recordings include the marriage of Amie House and Phillip Foster on November 19th 1594, at St. Benet Fink, in the city of London, and in France where for various reasons most recordings are much later, that of Yvonne Houssay at Phelan le Grand, Ille-et-Villaine, on March 1st 1667, and that of Jean Francois Housiaux, at Brognon, in the Ardenne, on August 31st 1797, at the begining of the Napoleonic Wars. The first recorded spelling of the family name is shown to be that of Simon Hus. This was dated 1226, in the Eynsham Cartualry of Oxfordshire, during the reign of King Henry 111rd, known as "The Frenchman", 1216 - 1272. Throughout the centuries, surnames in every country have continued to "develop" often leading to astonishing variants of the original spelling.